Can anyone remember exactly when this was? And think they’ll do it again? Yes I remember this too. I think the benchmark for the 125k pack was >110 days or something. Yes! It was around this time wasn’t it? Or Christmas time? But what was it for? From EA's site > This is for FIFA 17 ofcourse. 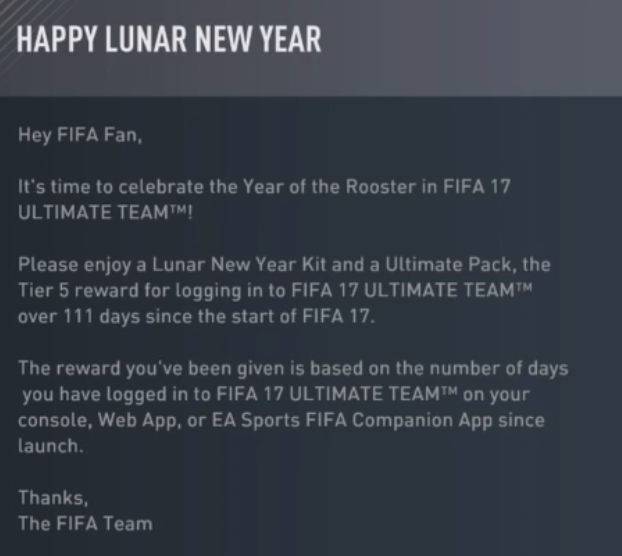 Lunar New Year starts 16 Feb this year though. As in the real date of the festive period. Not sure when EA will do their promos, but I think it coincides exactly with the festive period. Lunar New Year starts 16 Feb this year though. Even better, gives me the chance to log in a few more times .